ALBERTA and BC—Canada—For a truly adventurous whitewater rafting Alberta experience, head to the Kicking Horse River. This stunning glacier-fed river, colored a stunning turquoise, draws droves of tourists each year from May through September. Named in 1858, the Kicking Horse River connects through the Canadian Rockies to the valley of the Bow River. The Trans-Canada Highway traverses the river at several points as it goes west from Yoho National Park to Golden, British Columbia. Blending incredible scenery with rich history, the Kicking Horse is an ideal place to experience the excitement of whitewater rafting. Nature lovers should also know that the river is abundant with wildlife which frequents its banks. The morning section of the Kicking Horse begins in Yoho National Park and offers prime wildlife viewing. Rapids here range in difficulty, suiting rafters of all levels. Beginners, or families looking for a calmer ride, can start out on Class II rapids, while more seasoned rafters can take on the Class IV waters. Scenic float rides are available for families looking for a slower pace. Those looking for a wild ride can continue on to the Upper Canyon, where Class III and IV rapids are sure to rock the boat. Enjoy the unbelievable scenery of the Kicking Horse River’s Lower Canyon. Rafters float through high-walled canyons while navigating an exciting set of rapids. After the adrenaline rush of whitewater rafting is over here, there is a relaxing float along calm water through town. Ideal for first-time rafters, this no-experience required whitewater rafting trip on the Kicking Horse river will begin on the Upper Reaches of the river in Yoho National Park. You’ll learn to work as a team as you master the paddles and the waves. After a riverside BBQ lunch, don’t settle in just yet: you’ve got 22km of whitewater to raft! Take on the challenge on your Canmore-Kananaskis vacation. On this Canadian Rockies whitewater rafting adventure, you will experience one of the most thrilling sections of the river. 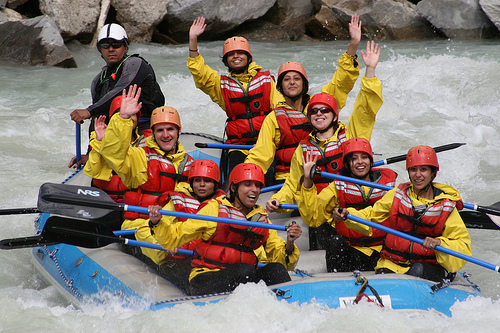 Continuous Class III & Class IV+ rapids will have you soaked in no time! You’ll raft down the Middle and Lower Canyon, and you can even try a supervised swim of a Class III rapid at the end of the trip if you’d like. All experience levels are accepted for this ride.